The Jugs Softball Machine is our best softball pitching machine, which has a digital display for easily reading the current speed. 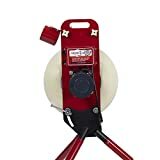 You can use standard 11 to 12 inch softballs with this pitching machine and it can also be used for pop-ups, fly balls and ground balls. Our step-up pick is the ATEC M2 Offensive and the head of this pitching machine can tilt, allowing different targets for the pitch. Its die cast wheels also gives it mobility like our top pick. Machine recoil is not a problem due to the frame being made of rugged steel with a tripod base. The budget pick is the First Pitch SoftballMachine and the aluminum construction makes it both lightweight and durable due to the added steel. It can be easily switched between the two tubes to go for either baseball or softball practice. The speed is easily adjustable with this pitching machine. A softball pitching machine is much like the baseball pitching machine, except that it is meant to take softballs instead of baseballs. 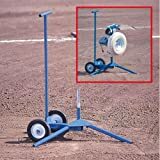 While there are many pitching machines out there that are double purpose for both baseball and softball, there also exists some pitching machines that can also be solely for softball only. Baseball and softball both have different rules and regulations despite being quite similar in game style. One of the things that make them different are the pitches and the balls. The softball is different from the baseball in various aspects and the style of pitching is also something that is varied between the two. This is why there are specific pitching machines that are meant for softball. 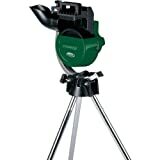 A pitching machine is very helpful for athletes in many ways. First of all, it can help you train yourself to hit the ball better at a higher rate. This is important for those who want to improve their hit ratio in softball. It is good for helping you get the sweet spot hit better so that you can avoid damaging your bat. While it is true that there are softball pitching machines out there that solely focus on softball, it is hard to find them because of the fact that softball is not a popular sport compared to baseball. Hence, your best bet is to find a baseball pitching machine and see it if has a bunch of options for softball for you to practice your softball hitting skills. Ease of use and setup: you should pick a softball pitching machine that is simple in terms of its switches, operations and how to set it up. The user instructions or manual should be clear and concise so that you will know how to troubleshoot it in case of any emergency. The buttons and all of the functions of the softball pitching machine should be indicated in the manual for reference. Home or commercial use: do consider if the softball pitching machine is ideal for home or commercial use only. Most softball pitching machines are made to be in a team so they should be durable and are of heavy duty when it comes down to pitching. 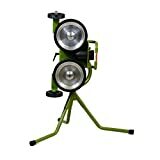 A light duty softball pitching machine is mostly made for home or hobby use but most will use it for teams anyway so it should be of heavy duty. Speed options: a good softball pitching machine to consider is one that has a good set of speed options to choose from and can be controlled from a distance using a remote. In addition to that, having an “inconsistent” speed for a softball pitching machine makes it more realistic and mimicking that of a real player when it comes down to making softball pitches. If you have more budget then that is a good softball pitching machine to have. Portability: you should consider a softball pitching machine that is easy to take down when you are not currently using it. This helps so that your machine does not get in the way of other people who might be training with another sport. 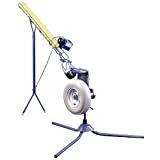 It is important that a softball pitching machine can be easy to assemble and to take down because some softball pitching machines are used for traveling teams. 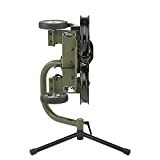 Compatibility with other sports: in addition to softball, the machine may also be a dual purpose pitching machine for baseball and other sports. The softball pitching machine will usually be a 2-in-1 pitching machine anyway, because softball is not as popular as baseball, hence most baseball pitching machines can also be softball pitching machine in a way due to the other functions it can perform. Pitching style: you should consider the different pitching styles that are available in a softball pitching machine, as it will be covering most softball pitches for you to practice instead of going through your coach to train your softball hitting sills. Do remember that pitching in baseball and in softball can be different so don’t always assume that a baseball pitching machine can also be a softball pitching machine, unless it is indicated. Power options: the softball pitching machine will mostly be plugged into electricity but some portable models can also take batteries, which allow you to take them with you during travels for national and international competitions and practice purposes. Warranty policy: when you buy a softball pitching machine, you should know which parts of the machine are covered with the warranty so you know what to expect. The =”Jugs Softball Machine is our best softball pitching machine that can go on speeds from 15 mph to 60 mph and is applicable for nearly all age brackets of softball. It is easy to move around and has cart to make it more mobile for all-around use. The 360 degrees of movement allows many kinds of pitches and you will always see the ball due to its design. It has a warranty of 5 years to back it up. The only concern but not a deal breaker with the Jugs Softball Machine is that it might not be good for real leather balls as well as synthetic balls (but you can still use them), but this is true for most pitching machines anyway, so stick to dimpled balls instead when using it. The ATEC M2 Offensive is our step-up pick and is great for college level and professional level players who are into softball. It can pitch breaking balls as well as fastballs. It can use dimpled balls, foam balls and leather softballs of regulation size. The speed of this machine can go up to 90 mph and it has two wheels for more realism when throwing the ball towards the player. The First Pitch SoftballMachine is our budget pick, which stands on 24-inch legs for ease of setup. It can go from 20 to 80 miles per hour in speed and accepts both baseballs and softballs. It can give you very accurate throws as a softball pitching machine. The compact design lets you take this out to the ball game practice. It has a 1 year warranty for commercial use and 5 year warranty for home use. The Ultimate Hitting Machine is a foldable machine that does not need to be powered up to function so you can take it to the field and practice hitting softballs. It can also handle baseballs and can be easy to use for most beginners. It is so portable that you can pack it in a bag. The Mound Yeti TwoWheel can reach speeds up to 90 miles per hour and can be converted from baseball to softball with the legs being detachable. You can make the machine pitch a variety of pitch types and it has transport wheels for mobility as well, with a 6-year warranty. The Heater Sports Softball is ideal for beginners and can vary in speed up to 50 miles per hour. The machine can load up to 12 balls and has a powerful 1/4 HP motor that runs on AC power. It can also make fly balls and ground balls as well as line drives. It has a 1-year warranty and an enclosed wheel. The 14-Ball Softball Feeder accepts most standard 12-inch softballs and pitching machine balls. Made of a lightweight but durable steel frame, it has a 5-second interval for balls. It is quite portable and has a 1 year warranty. The Jugs Sports Combination is ideal for countries like those in Europe and Asia and want to have a softball pitching machine for their 220-volt system. It is also capable of baseball pitching so it is a dual purpose machine. It can go as fast as up to 124 mph and has a 5-year warranty. The ATEC Power Streak is ideal for outdoor and indoor use and can also accept baseball due to its switchable set of legs. You can also use mini ball retainers plus make easy adjustments on the machine. It works on 110-volt systems. The Triple Play Softball has a three-wheel mechanism which makes it more realistic than the 2-wheeled or the single-wheeled pitching machine. It is great for both field and indoor practice and can be a great tool for helping you improve your batting skills. 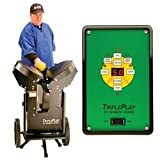 It is portable and can be used on batting cages as well. It is capable of making different softball pitches. 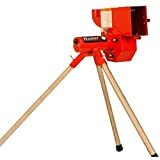 Other softball pitching machines did not qualify in our list because they were lacking in durability as well as realism. It is important for any training machine for softball to be just as good as a player and can suffice some of the skills that they lack when it comes down to softball pitches. Q: How is baseball different from softball? While it is true that most softball teams are comprised of women and most baseball teams are comprised of men, it does not necessarily mean that both sports have specific stereotypical gender requirements. There are men who play softball as well, much like how some men play volleyball too. Gender is not a basis for judging the pitching and hitting skills of a person. The pitching requirements for softball is an underhand pitch, this is why it is different from baseball and you should consider a pitching robot that will help cater to your needs of an underhand pitch in softball. In addition, while certain pitches in baseball are similar to softball, they can be different in some parts not just due to the underhand motion but also to the direction and speed. Q: Which is harder to play: baseball or softball? Some people say that softball is harder but it is actually easier because of the proximity of the bases and the more likely chance of an infield hit. Perhaps one of the factors is in the reaction time of the sport: baseball’s reaction time is significantly faster than that of softball, making it seem easier than softball. While the batting average for most baseball players are significantly lower than that of softball players, it is because the metrics for softball are different from that of baseball and the situations are also not the same. It is important to know that the speeds in softballs have a counterpart in baseball. While the speeds appear slower, because of the game style of softball, the speeds of around 70 mph in softball actually equate faster speeds of up to 90 mph in baseball. Q: What are the different pitches in softball? • Speed: the speed of a fastball can go up to 70 mph, which is equivalent to a baseball pitch of 95 mph. • Motion: it is thrown directly but with a little bit more spins from the pitcher before it goes into a standard underhand pitch for softball. The change-up is meant to be a deceptive trick to the batter that you seem like you are doing a fastball but you are doing a change-up. • Speed: it is a bit slower than the fastball and is meant to deceive the other players. • Motion: the softball change-up works much like the baseball change-up – you don’t snap your wrist when you release the ball, so the batter is in for a surprise. The drop pitch is basically what it is – dropping the ball to the floor to cause a trick to the batter when pitching the ball. • Speed: it can be similar to the fastball, but a bit slower. • Motion: the motion of a drop pitch is like the motion of a fastball but you release it with a downward spiral movement. The curveball is one of the most difficult types of pitches in softball that requires wrist twisting to perform a decent swing. • Speed: may not be as fast as a fastball but can be tricky to hit. • Motion: the curveball spins so it is the hardest to track for the batter, making it an effective pitch for inexperienced players. The rise ball, out of all the softball pitches, is the most difficult of all. It is the opposite of the drop ball and requires hand twisting to make the ball rise. • Speed: the rise ball probably has a similar speed to the drop ball. • Motion: it is thrown in a rising motion with a hand twist. This makes it tricky to hit for the batters. The softball pitching machine has the ability to help young players to train on how to receive a pitch properly and how to respond to different kinds of pitches. If you do not have someone to pitch you a ball then you can train with a pitching machine to help you out. Q: What are the different health benefits of playing softball? You get muscle strength. Specifically, softball targets many muscles in your body, mostly in the arms and the upper body, such as the forearms, triceps, rotator cuff, biceps, deltoids and the like. You need to swing with full force and this is why upper body muscles can be developed thoroughly if you go and play softball often. If having a good upper body workout is important for you then softball is a good choice due to its pitching and batting. You get a fully conditioned body. Softball is a sport that, like baseball, involves many parts of the body so you need to run, catch, throw and hit the ball while in the field. Having a multitasking sport can help you get a properly conditioned body so that you will have a more balanced exercise or physical activity in the long run. You also get more power, strength and endurance. Running all day in the field can help with your overall endurance so that you do not get tired easily in any physical activity. You also get a power boost because of constantly having to use your upper body muscles to pitch, catch or hit a ball, which can be a good workout for you to build strength in your body. Softball is a great calorie burning workout. You can be burning up to 300 calories for each hour that you get into softball. As one of the highest intensity workouts and sports out there, softball can help you lose weight if it is your fitness goal, and can help you stay fit when you’re previously living an unhealthy lifestyle. Flexibility is one of the key benefits of getting into softball. You need to have flexible body parts in order to make actions in softball, such as catch a ball, hit a pitch, run around the bases and many other things. With proper flexibility, you will be less prone to having injuries due to having tight muscles. Therefore, it is important to have proper drills and warm-ups before playing softball. Your core and lower body muscles can be toned as well. If you want to tone your abdominal muscles as well as your legs due to constantly running around the base or catching the ball, softball is a good sport for you, especially for women or anyone who want to get physically fit. You learn the value of teamwork, friendship and working together with people. Softball, much like baseball and all other team sports, promote a lot of teamwork as well as strategic thinking between people. If you want to enhance your ability to cope with a team or a group then softball is a good sport to do so. It can be a great starter for your children to learn the value of teamwork at a young age. You get a sharper mind and thinking stability with softball. Like baseball and all other team sports, softball requires a lot of mental focus and this is a good thing to develop at a young age, and even for adults and those near their 40s to help them keep a sharp mind and good memory. Any sport or physical activity can help you feel more focused with anything so it’s a good break from work or school. If you are aspiring to have leadership skills then softball is a good sport for you. Like how it teaches teamwork, you can also learn ways on how to be a good leader in a team by playing team sports like softball and baseball. It helps children learn how to assign and delegate tasks to teammates and also how to assess situations to get the team’s fighting spirit together to be able to win a game. You can fight depression and feel happy about yourself with softball. It is a good confidence booster and can improve your mood as well, like with any sport or physical activity. Once you can find something that you are good at, like pitching or batting, you can feel more confident with yourself and you can have more self-esteem. This is important for kids so that at a young age, they can develop good positive thinking skills and a never-give-up attitude. Q: What are the different softball divisions for women out there? Minor league is a division that focuses on slightly older kids and aims to teach more than just the fundamentals. Minor league players can compete on actual games and the league or division has three subdivisions: machine pitch, player pitch and coach pitch. The little league or the major division is more for the older kids and the pre-teens. They can compete in international tournaments and the like and they get financial support for such tournaments. The junior division is meant for the younger teens and can also compete internationally with financial support. The senior division is the highest division for the softball sport for girls in the Little League. They are mostly comprised of teens and young adults and can also travel and compete internationally with all expenses paid. Q: What are the basic equipment you need for softball? The bat for softball is usually similar to the baseball bat, but slightly longer and thinner when it comes down to the barrel diameter. Like baseball bats, you can also choose from wood, composite or aluminum when choosing a softball bat. Choosing a good bat is important for you to hit the ball more precisely without much delay when you are swinging. The ball is also important in softball, and isn’t really that “soft” as the name implies because it is made out of mostly rubber, cork, leather and sometimes synthetic to make it durable. It is a little bit softer than that of baseball but not that soft. The standard size of softballs can be 12 inches and can be colored bright yellow for tournaments. The weight is usually 180 to 200 grams per ball. The gloves used in softball can be similar at first with the baseball gloves, but the difference is in the size, since the ball that you need to catch with softball is slightly bigger than that of baseball. The positions that will most likely wear mitts along with gloves are the catchers and the first base positions. The helmet is also highly important because it can protect your face from getting hit by a softball, much like with baseball. The usual material used in making a batting helmet is plastic with a combination of foam for both durability and comfort at the same time. Since most softball players are women, there can be pony tail holes for them to feel comfortable. The softball helmet usually differs from baseball due to the wire face guard that is attachable. Sliding shorts as well as other safety clothing and equipment can be worn in softball to help protect a player from potential injuries and the like. The slider is similar to the shin guard in most contact sports. There are also throat protectors, face guards, chest protectors and the like for most softball catchers to keep them protected at all times. Q: What are the usual materials that make up a softball? • The kapok material is ideal for most professional games such as for college players. Kapok comes from a South American tree and can also be found in Central America. It has good durability and can be mixed with polyurethane to create a softball that does not easily vibrate and damage the softball bat. • The rubber material and cork mixture is a type of core or softball material that is meant for kids, for youth level and for game room or leisure purposes. If you aren’t that serious with softball then you can typically go with a mix of cork and rubber for your softball material. Regardless of material that makes up a softball, a regulation sized softball should be 12 inches to the exact measurement for it to be tournament legal. Like baseballs, softballs also have woven yarns so they may look pretty identical at first glance. Q: What is the typical bat length in softball? How is it different from baseball? As you can see in the chart above, the minimum length of softball bats are usually longer than that of the minimum length of baseball bats. This is because softball has a different requirements for hitting the ball due to the different material and size of the softball as compared to baseballs. Q: How is the size of a softball different from a baseball? As you can see with the chart above, baseballs are usually smaller and lighter than softballs, so it is kind of odd to call softballs “soft” while they are usually the ones bigger than baseball. In addition to that, smaller leagues for kids might also use a smaller softball than the regulation size for comfort. Q: What are the different types of materials used in a softball bat? Aluminum is a popular material for bats used in softball because of its lighter weight, which appeals for most softball players who are mostly women. Aluminum is also easy to control and not very heavy to swing and can be greatly durable against hitting the ball, but can be a little more expensive. Graphite and titanium or composite bats are the ones that are also made for durability but can also cost more. They are also light but the catch is that they can significantly reduce the vibrations when you try to hit a ball with a softball bat. Q: Can some baseball pitching machines also pitch softballs? A: Yes, some baseball pitching machines are also capable of pitching softballs so they can be used as a baseball pitching machine and as a softball pitching machine in one go. You should consult the user’s manual of a pitching machine to see if it accepts softballs and if it does the underhand pitch that the softball pitch requires. Q: What kind of balls can be used for a softball pitching machine? • Leather balls – these are mostly the standard types of balls that can be used in practice or competition. • Poly balls – these may be the training balls that you can load in a pitching machine. They provide more movement than leather balls and can fly faster. • Foam balls – these balls also fly faster like the poly balls and are softer and easier on your softball bat to prevent easy damage. • Always make sure that you load only the given number of balls that the pitching machine is able to handle. • Unless it is indicated in your user’s manual, you should not mix ball types so as not to confuse the machine. Some special machines can mix ball types for a realistic approach with ball speed. • Synthetic balls, unless your manufacturer allows you to use them, should not be used to avoid leaving residue on the machine as well as because of the fact that they can easily wear out after every practice. Q: How fast can a softball pitching machine throw a ball? A: It depends on your machine but most machine will be able to pitch the same speed for both baseball and softball, such as 60 to 70 miles per hour. However, there are also some special machines that have different speeds for baseball and softball pitching. The softball pitching machine can be easily tweaked for its speed, and most will have at least 20 to 60 miles per hour of speed, some exceeding up to 70 mph. The speed also doesn’t change no matter what distance you put it in. Nonetheless, the type of ball and the weight of the ball might have some effect on the pitching speed of your softball pitching machine. Q: If I want to set up a batting cage for either baseball or softball, what space requirements do I need? • For an indoor batting cage system, you may need $110,000 to $150,000 for the total cost. • An outdoor batting cage system can be pricier, from $150,000 up to $260,000 for the total cost. Q: What kinds of pitches can a softball pitching machine do? Q: What safety guidelines for softball gear are most common for fast pitch softball? They should have plastic cleats or molded / rubber cleats instead of metal because metal cleats are only ideal for baseball and for junior and senior leagues and not allowed in youth divisions. This is because metal cleats can be dangerous for young players so it is best to stick with molded cleats for their shoes. All softball catchers should wear proper gear. For instance, they should have proper gear such as mitts, face masks, chest protectors, throat guards and shin guards, aside from the helmet. In addition to that, athletic cups should be worn by male catchers. Major players in the game who get the most exposure and action should wear a properly fitting helmet, especially batters with batting helmets. Some pitchers can also wear a helmet for safety. The helmet must cover your ears and should be fastened just right if it has a chin strap. You can also add a face guard for better protection. You should also check out the rules of your local softball association or league to know which bat types are not allowed and many other rules regarding softball gear. Q: How is slow pitch and fast pitch softball different? Q: What is RICE and why is it important in softball? A: In any physical game </a such as softball, anyone can get injured by hitting the ball wrong or landing on a base with a sprained leg. This is why you need to remember the acronym RICE, which stands for rest, ice, compress and elevate, to address emergency injuries that occur in the game. Q: What causes softball injuries? • The length of the pitch as well as the number of innings can cause strain, sprains and injuries. • Base sliding is also a common injury as with baseball so most games should have breakaway bases to help promote safety. Q: What is the importance of warming up before a softball match? A: A warm-up exercise is important before every softball match to help players be free from injury such as strained muscles. A good warm-up activity can be stretching or some quick jogs. Overall, the Jugs Softball Machine is our best softball pitching machine, which holds a fair amount of ball types and has a good speed. It is great for practicing on how to hit most softball pitches.